In 1990, Bob Kuk of Kuk's Forest in Ohio registered this hybrid of H. 'Dorothy Benedict' × H. 'Northern Lights'. 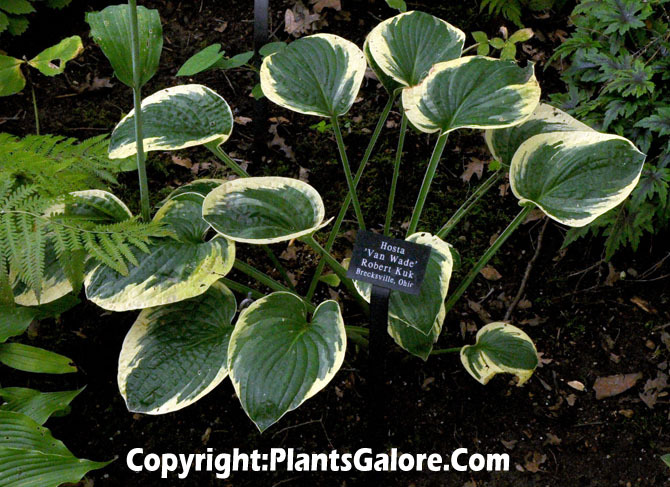 It is a medium size hosta (12 inches high by 17 inches wide) with creamy yellow to white margins and dark green centers. Pale lavender flowers bloom from late July into August on scapes up to 30 inches tall. According to The Hostapedia by Mark Zilis (2009), "This cultivar honors one of the most distinguished members of The American Hosta Society. Since the mid-1980s, Van Wade of Wade and Gatton Nursery of Ohio has developed the largest hosta collection in the world, covering more than five acres with over 3,000 types on display...Though it is a hybrid of two H. 'Sieboldiana'-types, it bears pale lavender flowers that are produced about a month later than either of its listed parents." Similar cultivars include H. 'Celestial'.